The PCCARD is a PC/104-Plus interface adapter that provides the 8/16 bit PC Card™ and 32 bit CardBus™ functionality to your system. PCCARD offers two independent PC Card™ standard slots that are backwards compatible with the PCMCIA standard. So PCCARD gives you access to the wide spread CardBus™, PC Card™ or PCMCIA Cards. 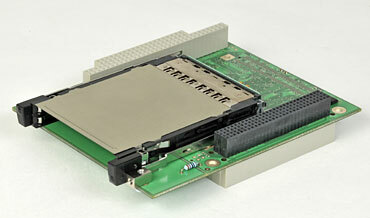 Through the huge functionality these cards offer your system gain in a maximum flexibility. 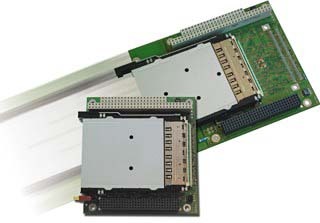 PCCARD is available as PC/104-Plus module or in a special MPL form factor used for the MPL packaged industrial PCs (PIP). These features make the PCCARD to the ideal, industrial solution if you need to expand your system with a compact, reliable interface that gives you maximum flexibility. PCCARD connects your system to any available CardBus™, PC Card™ or PCMCIA-Card. This allows you for example to expand your system by removable memory and/or I/O cards (Flash Disks, Ethernet, FireWire, Modem, and more). PCCARD-Cx Customer specific versions, please contact MPL for details. 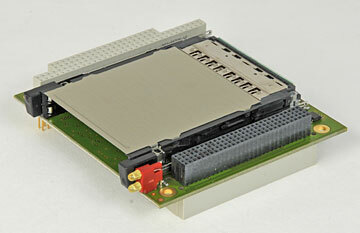 For deployment in harsh environments, the PCCard can be ordered in an extended temperature version. Every system needs to pass various tests in a climate chamber to prove that it will perform flawless over the temperature range indicated.